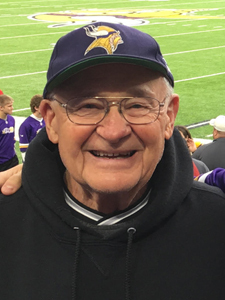 Wayne Segulia, of Prior Lake, passed away on January 27, 2019 at the age of 88. Mass of Christian Burial is Thursday, January 31, 2019 at 11:00AM with visitation beginning at 9:30AM at St. Michael Catholic Church in Prior Lake. Father Tom Walker will preside, and his children will act as pallbearers. Wayne will be laid to rest at Fort Snelling National Cemetery in Minneapolis with full military honors proved by the Fort Snelling Rifle Squad. On July 23, 1930, parents Mathew and Frances Segulia celebrated the birth of their only child, Wayne Mathew Segulia. Wayne grew up in Butte, Montana, an old fashioned, rough and tumble mining community. Living in Butte during the Great Depression instilled a strong work ethic in Wayne. From an early age, Wayne worked underground in the copper mines nights and weekends to help support his family. Following his high school graduation, Wayne attended the Montana School of Mines. Before completing his degree, Wayne enlisted in the United States Air force. He was stationed in Japan, Korea and numerous places in the United States. Wayne was a fighter pilot and was part of a top-secret group of nuclear bomber pilots. Wayne was always so proud of his military service and grateful that he never had to deploy a nuclear bomb. After his honorable discharge, Wayne returned to Montana. He began working for commercial airlines, and eventually ended up at Northwest Airlines. He provided a wonderful life for his family. His work brought him to Prior Lake, MN, where he raised his four children. After 31 years, Wayne retired from Northwest as Captain on the DC10. In the mid 80’s, Wayne met the love of his life. Wayne and Carol were married on September 21, 1985 and blended their two families together. Although most of the kids were out of the house by that point, Wayne and Carol always made sure they had a loving home where all their children, grandkids and family dogs were welcome. Wayne was always active in his free time. Golf was one of his favorite activities. Wayne even golfed 18 holes in October before his health began to decline. An avid outdoorsman, he enjoyed fishing, hunting, spending time at the cabin up north, and hiked Pikes Peak at age 65. For years, Wayne was dedicated to addressing the “squirrel problem” at his house. He would catch and release them far away from his own yard. Despite the relocation, they always found their way back! As a faithful man, Wayne served as an usher at St. Michael Catholic Church on the Saturday night crew. He also volunteered at the CAP Agency with the food shelf. Wayne had a kind heart and was always happy to help others. Family was the most important thing in Wayne’s life. He was a wonderful father & grandpa. Wayne was also a dedicated husband and loving caretaker for Carol. Wayne is loved and missed by his wife, Carol Segulia; children; Mark Segulia, Mike (Cindy) Segulia, Matt Segulia, Margy Segulia, Jeff (Lori) Doerr, Brad (May) Doerr, Crystal (Paul) Dvorak; grandchildren, Jessica, Nathan, Kirsten, Carly, Dan, Steve, Jason, Hunter, Madison & his six great-grandchildren; other loving relatives and friends. Wayne was greeted in Heaven by his parents. Our thoughts and prayers are with you! He will be missed! I ushered with him at St. Michael’s for over 20 years. Carol, Mark, Mike, Matt and Margy, so sorry to hear of Waynes passing. He was like my second dad growing up next door to you guys. I think I spent more time at your house than mine. My prayers are with you. Carol and family, I am so sad to hear this news. He was such a wonderful man and a great friend and neighbor to our family. Always with a ready smile. He will be greatly missed! I’m so sorry to hear of your loss – and sending thoughts and prayers for comfort during this difficult time. He was a wonderful friend to our family – God bless him and you all. Thinking of you and of the many good memories from so long ago. I hope you are comforted knowing he is as peace and in a better place. Carol, Mark, Mike, Matt, and Margy – Thinking of you all after hearing of Wayne’s passing. Many happy neighborhood memories of your wonderful dad. Thank you all for sharing him with the Davis Family throughout the years. Carol and family. The time came too soon for Wayne to leave his earthly life. But what a full life it was! Know that he is now in the loving arms of Jesus. You are in our constant thoughts and prayers. We can’t tell you how sad we are to hear of Wayne’s passing. I flew with Wayne as his second officer on the 727 many years ago. My wife, Barbara, and I are both from Northern Idaho and I worked in the silver mines near Wallace. So very so sorry for your loss. Sending prayers and love to all of you. Just flew a couple of trips with Wayne but his insight was amazing. His words that he spoke hit home in a way that you will never know. As a son of an alcoholic he said in his own way that it is not your fault so let it go. I shall be forever grateful. So sorry. Fortunately I grew up in the neighborhood knowing “Mr. Segulia”. And fortunately again, knowing him as “Wayne” when Scott and I would stop-in for a visit. He always made us feel welcome! Carol and Family – Sorry to hear of Wayne’s passing, he was a wonderful man who helped keep the neighborhood fun and lively with his big heart and helping hands. He must have enjoyed watching the kids play baseball in the front yard – we sure had fun playing and I’ll remember his genorosity for providing that little “field of dreams” for us. He was a great guy ! God Speed and Farewell Old Buddy. We never had a chance to fly together at NWA because our seniority numbers were too close together. However I enjoyed your warm friendly personality when we’d be in a BS chat with the other Pilots in the crew lounges. I’m going on to 87 years old soon and due to my Health condition will probably be joining you in the not to distant future. We were so sorry to hear of Wayne’s passing, but take comfort in knowing that he is resting peacefully in the arms of the Lord. His smiling face and warm hugs were the perfect start to a Saturday night mass, and we will think of him often in his usual spot in front of the Holy Family Room. He was a gem of a man! Our prayers are for peace, comfort, strength and grace as move through your grief. We were so sad to learn of Wayne’s passing and are sharing in your sadness as you remember him. Have so many great memories about growing up in our neighborhood, watching the first man walk on the moon from the Segulia’s basement and the fourth of July fireworks from the baseball field. Sending healing prayers and comforting hugs in this time of sorrow. Carol and families, no one could ever have better lake neighbors than you folks were and what great times we had going to the casinos and playing together, even if we didn’t win. Our family all thought Wayne was a great guy also and were sorry to hear of his passing. Will be up to see you soon, Carol. I flew many months with Wayne on both the Electra and the 727. I really enjoyed his company in the cockpit and on the ground, a great guy. Carol & family, You all were truly blessed to share your lives with a wonderful man. Always positive & zest for life. Keep your memories close to your heart. Hugs to all. Wayne introduced me to mountain flying on the 727 and Beech-Nut chew. I will always remember Wayne for not only being a great pilot but also a true gentleman. Diane and I are saddened by the loss of Wayne in this world. We both had the pleasure of working with Wayne at NWA. I worked with him as a second officer on the 727 and the DC 10. Diane worked with him as a flight attendant. He was a great pilot, a great captain, and most of all he was a genuine gentleman. It is a pity that he is gone, and it is a pity that God doesn’t make any more people like Wayne. God bless you and your family. If you need any help, let us know.